Daddy was a man of many words. No, he wasn't redundant or repetitive, nor even reiterative. 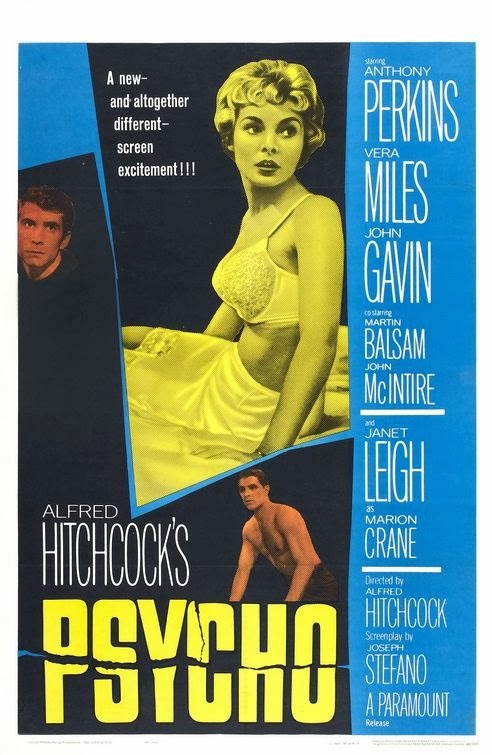 His vocabulary was extensive and he was intrigued by language—words, expressions, and colloquialisms. He knew about origins of words and derivations of phrases through his constant research, always enjoying the process of learning. One major player in his quest for knowledge was the well-thumbed Webster's Unabridged dictionary that graced his desk in the living room. Dictionaries weren't a big part of his working life but were important tools in his leisure activities. The 1961 edition—his last one—still serves me well. Of all my dictionaries, it is the one of choice, and when it's idle, it rules the upstairs hallway from its prominent wooden throne. Daddy never finished college because he had to go to work, but he had a boundless passion for knowledge. He thrived on the challenges of my high school and college homework assignments. During the first few months of my sophomore year of high school, I anguished over geometry. Daddy studied the textbook, and over Christmas vacation, we spent many hours learning geometry together. His logical mind quickly grasped the concepts and he managed to teach me all we had covered in class so far, plus much of the material I needed to know during the school year yet to come. Occasionally daddy would ask what we were covering in history. The way it worked is he'd say, "What are you reading about?" I'd answer. He'd look it up in the Columbia Encyclopedia, read about it, and tell me the highlights. He didn't stop there but continued looking up related topics. For example, if the book sent him to one reference, on to [it] we would go, which in turn might lead to another, etc. 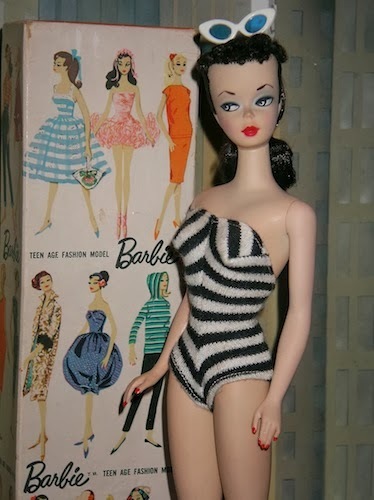 Sometimes it seemed we'd spend all night, me on the couch, he on a chair, following all the references, one leading to the next like a never-ending interrelated network of facts. All the Arensberg boys had a knack for language and words. Sid was a cryptographer who during W.W. II decoded secret messages, and Harry "spoke Spanish like a Spaniard," according to my mother. Leo, the multilingual youngest brother, taught several languages at a military prep school. English wasn't their parents' native tongue. Louie and Anna spoke Yiddish, for they were from the old country. But maybe living in the melting pot of NY where varied languages and dialects were spoken is how their sons' fascination for languages emerged. But my father was the one who embraced the English language. Nobody could tell a story like Jules. Articulate, witty, and entertaining, my father was the premier raconteur. He enjoyed communicating with people. Based on the occasion, he could also come up with an appropriate quip or pun, or even quote excerpts from one of the many poems he'd committed to memory. His love for words consumed him in a "novel" way. No, he didn't write fiction; he constructed crossword puzzles. Many evenings would find him sitting at his desk in the living room, sharpened pencil in hand, fastidiously filling in a grid with either letters or squares on their way to becoming part of a challenging puzzle for the Herald Tribune or the NY Times. He was a celebrity of sorts to his loyal following of cruciverbalists and received lots of fan mail. Some people were frustrated by his cleverness; most were impressed. He also co-wrote puzzles with Herb Ettenson, a high school English teacher, and his best friend. One evening a week or so, they had meetings to toss around ideas for puzzle themes. When they met in my house, I did my homework in the living room where they worked. I would curl up quietly with my books on the living room couch and try to be invisible so I could stay and bask in their creativity. The February 1992 NY Times magazine section had a tribute to the 50th anniversary of the [Times] crossword puzzle. In this featured article, 12 Sunday puzzles were chosen to represent highlights of the past half-century of NY Times crosswords. Daddy would have been thrilled to see that one of his was selected. Although he hadn’t attained a college degree, it was not for lack of scholastic ability. One of our favorite fan letters was from a man who had bet a friend whether daddy had graduated from Harvard or Yale. A family story recounts that when he was in the sixth grade, he took a national teacher's exam and scored near the top. Although I can't personally account for the veracity of that tale, I do recall the many times he was paid by the TV networks as a consultant. He'd play a contestant in simulations of proposed quiz shows and would give feedback on considerations like ease of playing, scoring, and question difficulty. My childhood was filled with word games and learning activities of all kinds, most of which required some reference materials and a pencil and paper at most. We played games in the house, walking outside, and riding the subways. To this day, I can entertain myself with these same games when I’m waiting on a line or in a doctor's office—anytime I have a few minutes of idle time and want to exercise my mind. Each day when I relax with the NY Times puzzle, I think about my father and thank him for his special legacy—the love for language that now lives within me. Lyn also sent me a fascinating article written by pre-Shortzian and Shortz-era constructor Louis Sabin about a puzzle constructed by her father. The article, "The Gol-dangest Crossword Puzzle Ever," appeared in the September 1962 issue of Pageant magazine and contains the puzzle "Roman Holiday," which was originally published in the Times on December 8, 1957. To read the article and see the puzzle, click here. Thanks so much for both these wonderful pieces, Lyn! In other news, it's been a very busy week on the Litzstarter front—as I write this, we're at 12,350 on the litzing thermometer! Friday night, Ralph Bunker sent in 28 puzzles, putting us over 12,100! Then Sunday morning, he sent in another 28 puzzles, which were followed an hour and a half later by 7 from Denny Baker. Sunday evening, Todd (T) McClary sent in 7 puzzles, and a few hours later, Mark Diehl sent in 35 more (making his regular total more than 3,700 puzzles!). Just over an hour later, Brian Kulman sent in 7 more, putting us at exactly 12,200! Then Monday morning, Howard Barkin sent in 21 puzzles, which were followed on Tuesday morning by 7 more from Vic Fleming, 14 more from Mark, and 7 more from Brian. In the early afternoon, Nancy Kavanaugh sent in a mega-batch of 42 puzzles (putting her contest total at more than 200 and regular total at more than 700!). That evening, Mike Buckley sent in 7 more puzzles. Then Wednesday morning, Denny Baker sent in 7 puzzles (putting us over 12,300 on the litzing thermometer! ), which were followed an hour later by 7 from Ed Sessa. Thursday evening, Vic sent in 7 more, then late that night, Mark sent in 28 more (putting his contest total at more than 400 litzed puzzles!). Thanks so much, everybody—great job! Last week I wrote about going through two of Bernice Gordon's scrapbooks to record the dates her puzzles were published. Since then I've compared that list with my records, and out of 111 puzzle dates filling four pages, I found 7 previously unattributed daily puzzles, plus a discrepancy in the June 18, 1980, puzzle (in which Bernice was listed as the author, though according to Maleska's log, Jack L. Steinhardt was the author). 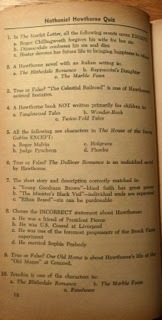 Most of the puzzles on the list were already in my database, and many others had question marks next to them, indicating that the puzzles did not look like they had been published in the Times (and, in fact, none of those marked that way had been). Finding just 7 (possibly 8) new puzzles out of 111 doesn't seem like a lot, but this one-puzzle-at-a-time process is likely how the remaining gaps will be filled in. Since Stan Newman sent me so many fascinating old puzzle books, I've decided to add a Book of the Week feature to this blog! I'll be featuring a new pre-Shortzian treasure every third week (with the other two weeks containing the usual Clue or Entry of the Week section)—I doubt I'll run out of new books to highlight anytime soon! 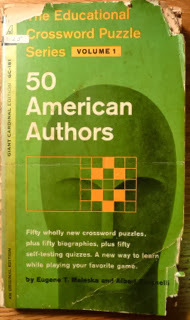 That said, this week's featured book, a small green paperback titled 50 American Authors, was written by Eugene T. Maleska and Albert Buranelli. 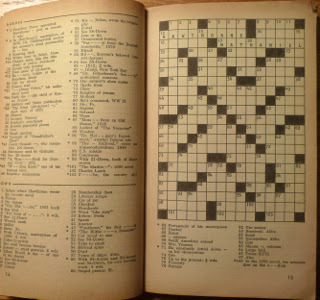 It was first printed in August 1963 and was part of a collection called "The Educational Crossword Puzzle Series." Each of the 50 American authors is profiled in a one-page biography, a high-quality crossword by a top constructor, and a mini-quiz using information from the biography and crossword puzzle. The crosswords themselves are designed like modern-day Celebrity Crosswords in that they're jam-packed with theme material about their subjects—a single 15x focusing on Henry James and built by crackerjack constructor A. J. Santora contained 32 theme entries! So how were these top-notch constructors able to incorporate so much theme material? I've determined that the answer lies in several fundamental differences between these crosswords and modern ones. The most notable difference is the use of what Maleska dubbed the part-word technique, which I've never seen before. The part-word technique involves using thematic fill-in-the-blank clues for short words instead of cluing them in a traditional fashion. For example, in the Henry James puzzle, DUC is clued as "*James was e _ _ _ ated privately by tutors" rather than something along the lines of "French nobleman." This cluing style is indeed very effective for cramming large amounts of information into a crossword puzzle, but it also feels sort of tacky, since many words don't have proper clues; also, it allows constructors to get away with an increased amount of less-than-stellar fill (particularly prefixes and suffixes) by disguising it as theme material. In other words, the part-word technique seems tantamount to the timeworn ruse of disguising vegetables as chicken nuggets in the hope that kids will be more likely to eat them. The other two differences I noticed are that two-letter words were allowed and that the grids weren't all 15 x 15. In fact, many grids were rectangular to allow for an even greater number of theme entries. The use of rectangular grids in top-notch crosswords was almost unheard of when this book was published and didn't really catch on until a few years ago; this innovation alone places 50 American Authors way ahead of its time! There are a few other noteworthy aspects of this puzzle book. First, Maleska constructed just one of the puzzles, which is surprising since he was also a major constructor in 1963 and is listed as co-author of the book. It can therefore be presumed that Maleska did much more work on the biography-assembling and quiz-writing, which isn't a huge surprise, given his literary and educational background. It can also be assumed, however, that Maleska was the editor of these crosswords, making this volume a fascinating glimpse into what his pre–New York Times editing style looked like. In addition, none of the clues have periods after them, a stylistic choice not widely used until Will Weng became editor of the New York Times crossword six years later. Finally, Maleska mentioned that he hoped the Educational Crossword Puzzle Series books would become supplementary materials for high school and college students. I'm always rather skeptical of crossword puzzle books targeted at younger audiences, as editors often forget that most students are unfamiliar with the crossword puzzle argot. As a test, I created some multiple-choice questions for my friends at school to see how accurately they would be at guessing the meanings of different pieces of pre-Shortzian crosswordese. To them, it seemed like I was speaking Greek! Anyway, I was surprised to discover that this book is not only accessible to a wide range of solvers (largely because of the part-word technique) but is also helpful. I recently finished reading The Scarlet Letter for my English class and remember that one of the test questions asked what year the novel was published in. I had no idea and ended up guessing a random year in the 19th century! 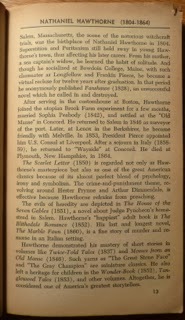 It turns out that the Nathaniel Hawthorne section of 50 American Authors mentions that The Scarlet Letter was published in 1850. Go figure! In sum, 50 American Authors was fascinating to look through from both a historical and practical standpoint. Thanks again for sending this book, Stan, and I look forward to featuring a new book in three weeks!